[Great spread of hope!] I want to publish “Klonoa Chronicles Data Collection” (Provisional)! I want to encourage Bandai Namco to create a publication “Klonoa Chronicles Data Collection”, which is a collection of unpublished, unreleased materials created during the development of the Klonoa series. If you would like to support us, please send us your feedback and comments! Thank you! 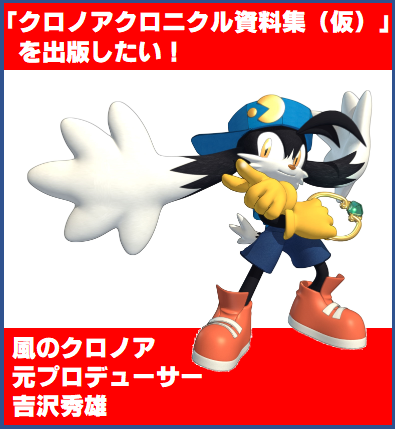 Big thanks to Klonoa @ Blog for translations! Original Twitter thread, send support here! Beat me to it (jk!). You better believe I am giving all my support to this! Thank you for your support! I’m surprised at the response from everyone above expectations. It may take some time, but I hope it will be advanced little by little. Thank you for your cooperation and support in the future! So far, Chronicle’s tweets have been executed by my own decision, but in the future, it will be a problem in making proposals and negotiations with Bandai Namco, so I removed some tweets voluntarily. Please understand. If you have downloaded the development data, please delete it. Thank you for your cooperation in realizing the project. Currently, it would seem Yoshizawa went and deleted all tweets involving storyboard artwork. We would like to honor his wishes so we are making all of those posts private as well as pages scanned from his book ゲームプランナー集中講座ゲーム創りはテンポが9割 (Game Planner: Tempo Is 90% Of Game Creation) as we personally see this as disrespectful and potentially takes away sales of the book. Thank you for your understanding. So far, there has been a combined total of 8,000+ likes/retweets between both the English and Japanese version of his proposal tweet! Keep it up everyone! ...So yeah, I've got all the Chronicles images saved to my desktop but, like I said above, will respect his wishes and keep them private. I don't want to hurt the chances of this book happening after all. Klonoa for Materials Book news with Yoshizawa's forgiveness. Namco launched the first Klonoa game, Klonoa: Door to Phantomile, for the PlayStation in 1997. The second numbered sequel, Klonoa 2: Lunatea's Veil, shipped for the PlayStation 2 in 2001. Two handheld games, Kaze no Klonoa: Moonlight Museum and Klonoa: Empire of Dreams, also shipped for the WonderSwan and Game Boy Advance, respectively. Namco released Klonoa 2: Dream Champ Tournament and Klonoa Heroes: Densetsu no Star Medal on the Game Boy Advance in 2002. A remake of the first game shipped for the Wii in 2008. Still curious on the progression of that's going. Nothing new yet but he has been keeping quiet and was asking about certain documents(?) a few days ago. His idea also got good reception so it seems that the book is a likely thing in the works now. Yeah, he's been pretty quiet which in this context I read as a positive thing. There's a 10k+ total of likes/retweets between the English and Japanese version of his posts too.